We’re heading into the autumn-winter part of the year and that means paths can quickly start to become very slippery, whether through moss growth, leaf mulch or, as temperatures drop further, ice. 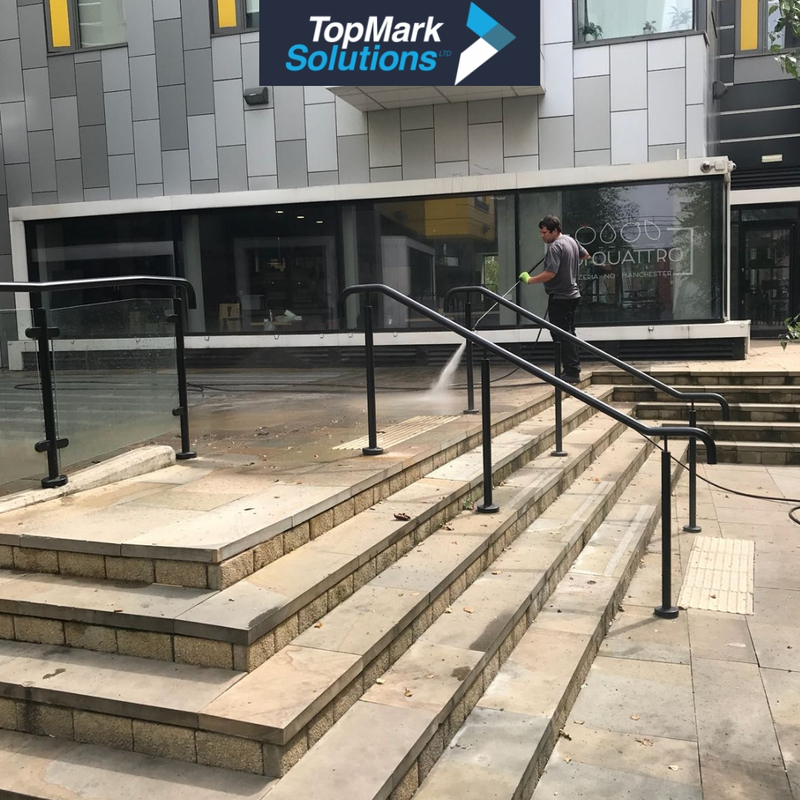 But you don’t have to put up with it – our path jet washing and thermoplastic line marking services can help you to clear a safe route across your premises for yourself, your employees and members of the public too. This is particularly important if the public have access to outdoor areas of your premises, from car parks to school playgrounds, or even just the pavement outside your building’s front doors. First of all, get your paths and other pedestrian surfaces clean of any moss and other growth that can turn slippery when wet. Our path jet washing service uses hot water for an even deeper clean, lifting the root structure out from any nooks and crannies to delay regrowth for as long as possible. And our Whirlaway technology reduces the total amount of water used – so it can be used even on sites with poor drainage or where the water table is high following a heavy rainy period. If you have a problem with standing water in summer, you’ll have a problem with surface ice in winter, and that can be much more dangerous. We can carry out high-level gutter clearance to make sure roof water run-off is making it into your drainpipes as it should, and not overflowing due to a blocked gutter. As well as that, we can conduct drainage inspection to identify and blocked or collapsed drains and get them flowing freely again, further reducing the risk of pavement puddles that could quickly turn to ice in cold weather. Finally, if you’ve gone to the trouble of giving people a safe route across your premises, make it clear where you want people to walk – it’s good for their safety and it shows that you are committed to health and safety too. Our thermoplastic line markings are a great way to add permanent safe route demarcation across your car park or any other hard surface, rather than just leaving it as open ground. In this way, you can mark out a pedestrian path that stays to higher ground or on a more textured surface, and guide people away from any areas where you know you have a problem with standing water and ice, but which for some reason cannot be tackled through better drainage. Previous Previous post: Back to School – with Top Mark Solutions! Next Next post: We are internationally recognised for quality!